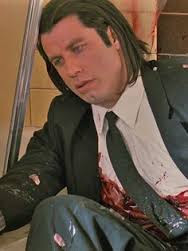 Remember that scene in Pulp Fiction where Travolta, who played Vincent Vega, killed the dude in the car and it's all bloodied up. So they go to Quentin Tarantino's house who tells them they can clean up the car and the body but his wife will be home soon and she'll call the cops if they're not gone. So they call Harvey Keitel, the Wolf, to make it happen. When he barks orders, Vega demands he say "please." It's a stupid and immature thing to do as time is of the essence. If they don't act fast, they'll all be carted off to jail. But Vega, whose pride and idiocy are his paramount character traits and ultimately seal his fate, still insists on Keitel, who is there to save them, saying please. In much the same way, Senate Republicans are demanding that Ted Cruz apologize before they allow him to save them from Donald Trump. Our government is run by a bunch of Vincent Vega's. They know that Ted Cruz is the only one who can stop Trump but still, they can't help themselves. Pride and idiocy makes them do prideful and idioting things. Republican senators said that Cruz must return to Capitol Hill and make the case directly to his colleagues to help ease long-festering tensions. And a large number of Republicans said the fence-mending starts with this: Apologizing to McConnell for calling him a liar last year on the floor of the Senate. That message — to smooth things over with Senate Republicans in a private session — was personally delivered by fellow Texan and McConnell’s chief deputy, Sen. John Cornyn, who spoke with Cruz by phone after the candidate won their home state’s primary earlier this month. Others had similar suggestions for Cruz. If he wants to save us, he'd better grovel to us.